transformation phrase: ghoul power, make up! attack phrase: ghoul order: cogito ergo sum! When Kim was alive, she was the school’s biggest gossip, friendly and talkative but always out for a story. She was never the best student, but she was pretty handy with a video camera. Her father runs a local tabloid, and she wanted to break into the business early. Though generally liked, she was never trusted except by the most naïve of people: she couldn’t keep a secret to save her life. Then she made the fatal mistake of trying to film Integra and Alex on the job. After destroying her film, they discovered that she was destined to become a Sailor Knight as well. 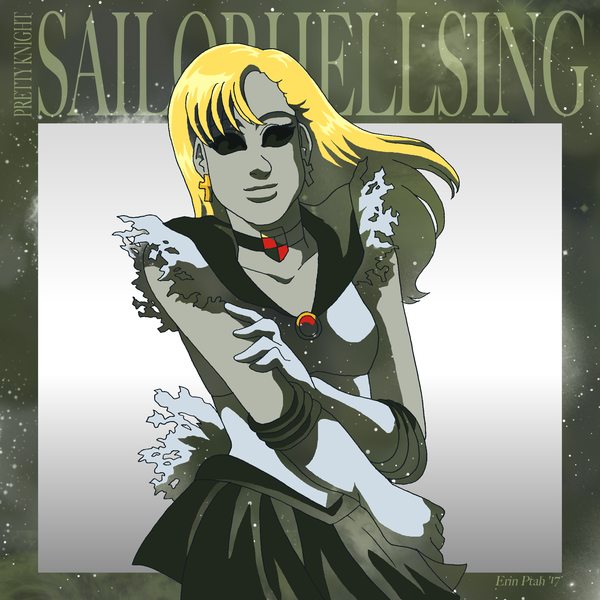 Turns out a prerequisite for becoming Sailor Ghoul was to become a ghoul herself — by being the masked vampire’s midnight snack. Kim is currently a walking, talking (though all in lowercase letters) dead girl living in the Hellsing mansion. Her order is the power to retain her mind, making her more like a low-level vampire than a basic reanimated corpse. Still, no matter how fashionable the clothes over it, her body’s cold grey skin and hollow eyes mean she can never go home. 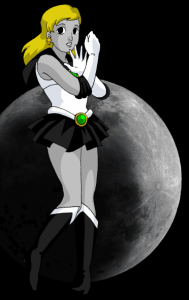 As Ultimate Sailor Ghoul, she gets an artistically-shredded costume and some finally-functional attack powers.